Home education has continued to be a huge learning curve for me, but every year that goes by God continues to give wisdom, courage, and peace in our decision to homeschool our children. 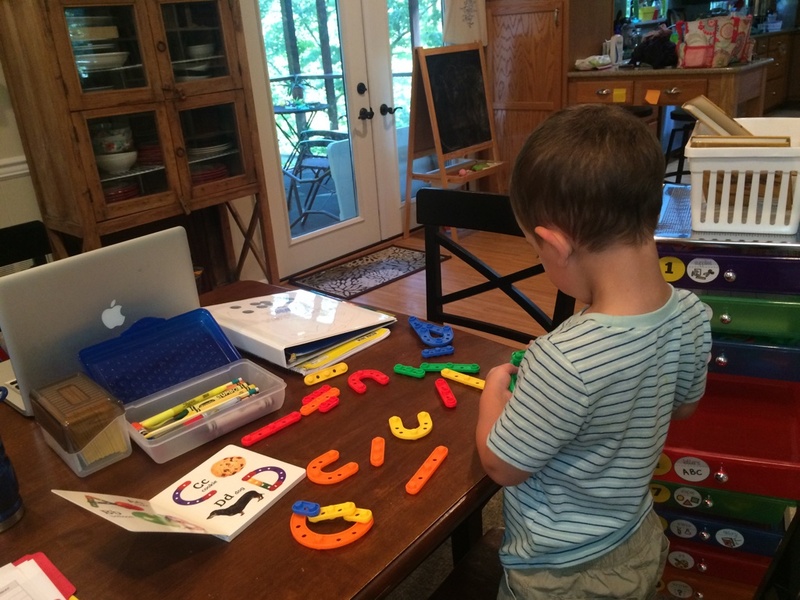 I started intentional toddler time with Sam when he was just shy of two years old. Because I knew we planned to homeschool, I started researching methods and philosophies of education long before I needed to actually implement anything. Throughout the last five years, my boy has grown, matured, and learned so much, and it’s all of grace that God is allowing fruit to sprout forth from the toiling and labor! 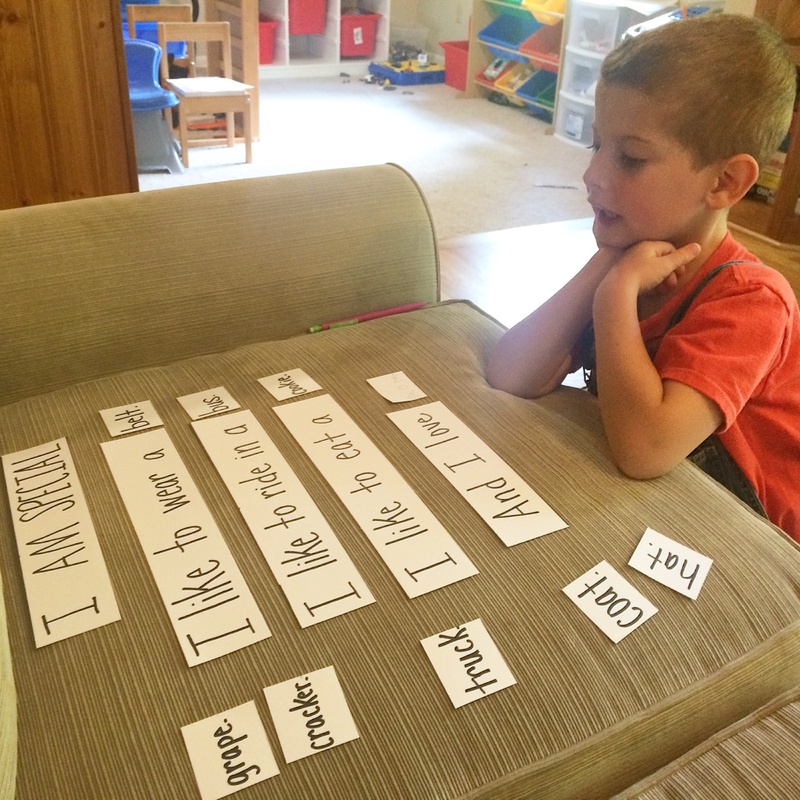 Sam is thriving, and it is such a joy to be a part of his life-long journey of learning. 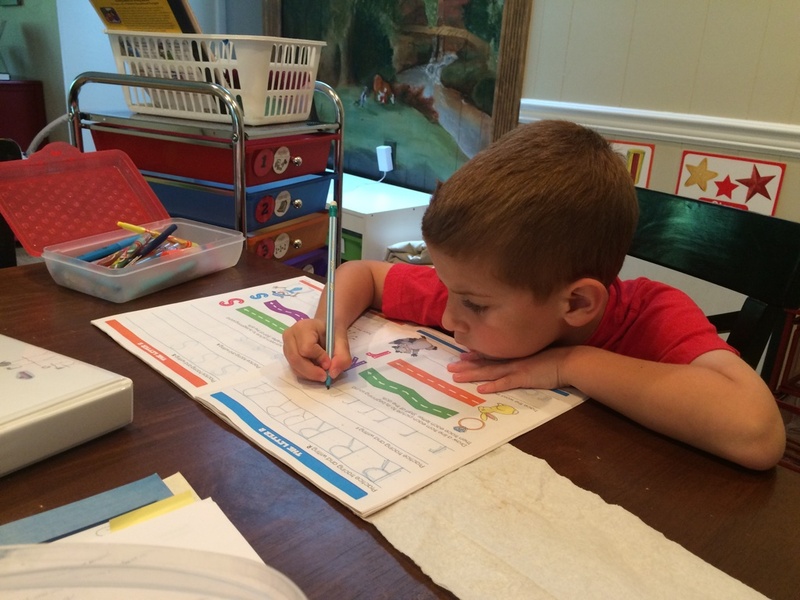 With that said, we decided to start him on kindergarten work last year at age four. He was fully ready and he’s always been a very eager learner. So, I figured I would just work slowly with him, never pushing harder or faster than he was ready, and just do two years of kindergarten. However, he turned five in January, and after that he just sky rocketed in his ability to learn new things, retain information, and focus for longer periods of time. 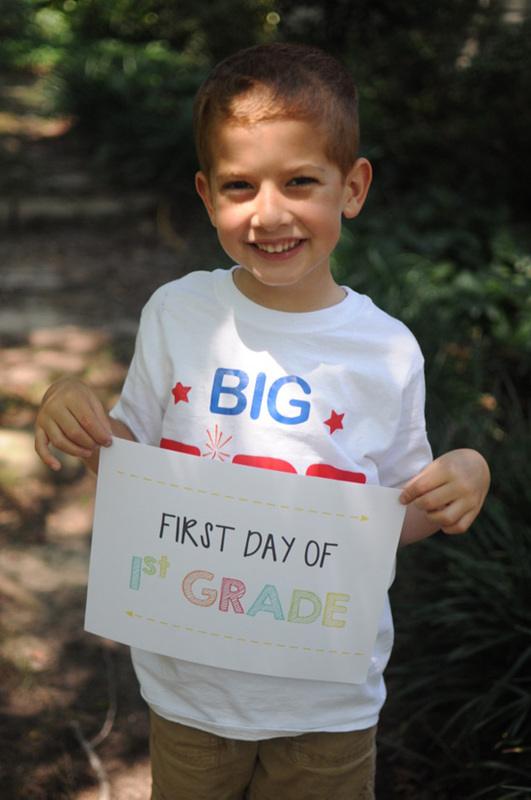 As I’ve taken time to evaluate where he is and where he’ll be in a few months when he turns six, we decided to move ahead with first grade this year. This was a very hard decision. We’ve prayed a lot, talked with several friends and homeschoolers, and weighed the pros and cons of moving him forward into first grade. But in the end, the only peace we found was in moving him forward full steam ahead. Plus, if you ask him, he’s in first grade. This means I will be teaching first grade and preschool this year with a new baby underfoot! Or rather strapped to my chest because she will.not.let.me.put.her.down. Even so, I’m oddly excited about the challenge. This is what I always wanted to do, so hard or not, I’m thankful that God allows me to do the work of ministry in my home. We’ve already started our new school year because the boys have been begging for a couple of weeks now to do school. Did I mention, eager learners? Plus it’s just too hot outside to do anything else, so why not? It’s going really well so far, and I can’t wait to see this new year unfold. Because I’ve been asked countless times on Instagram what curriculum I use, I decided to pull a post together to see if I can explain what I’ve decided to use this year. We do a lot of our subjects together during “Basket Time” which we try to do in the morning, but sometimes it doesn’t happen until the afternoon. 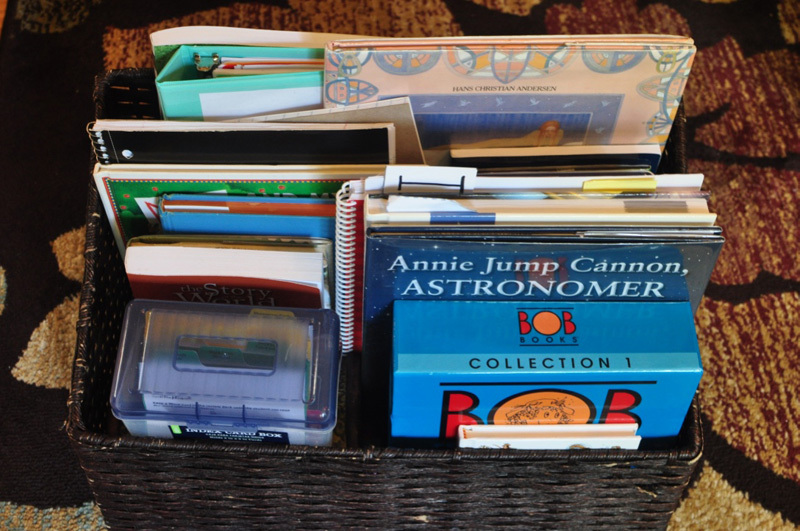 I’ll do a post later telling you more about “Basket Time” and the subjects we cover because it’s truly made our homeschool life easier. Really. Our curriculum choices are reading heavy. I loosely follow Ambleside Online Year 1. I make my own selections in books from the various curriculum we use to make it flow a little easier for me, but I use their plan as a guide. Basket Time is the bulk of our homeschool day. It takes more of our time than anything we do at the table. It’s the heart of our home, and it’s something we all look forward to. Even more than Basket Time, it’s important to know that we follow the idea of Charlotte Mason in that we give our children a buffet of subjects but we keep our lesson times short. We only spend 10-15 minutes on any given subject. 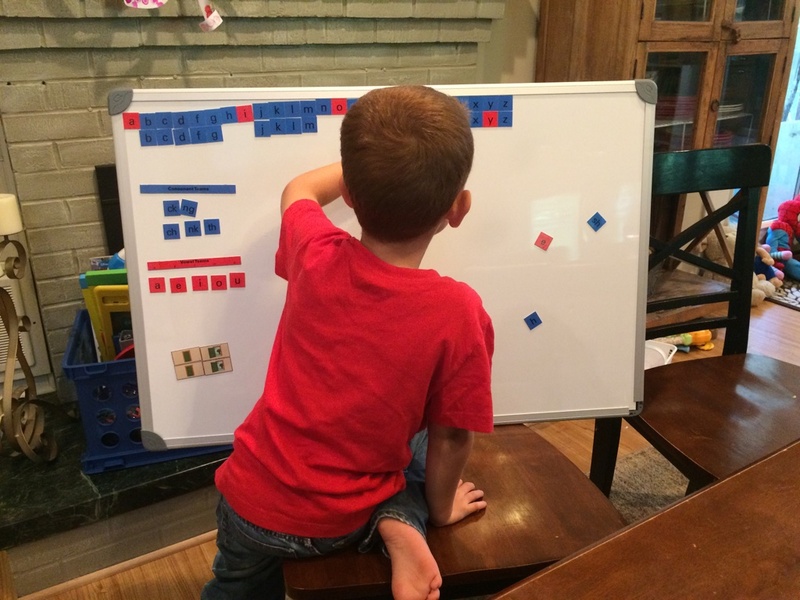 Sometimes Math will take longer simply because Sam despises Math, so he drags his feet a bit getting through the material (and I only assign one lesson a day … ). We will not be doing all of these subjects every single day. Or even every single week. I have crafted a rhythm and routine to our schedule – meaning we aren’t afraid of the immersion method of study at the neglect of another subject for a period of time. I keep a 10,000 foot view of the year and move rhythmically with the seasons. Speaking of routine. I’ve also been asked for our daily routine, but I want to be sure what we’re doing works for us before sharing. I’m still tweaking it as I get used to being a mom of three kiddos. So, that might be a couple of more weeks. Curious to see what he did in the past with Sam? We love the All About Reading program! We started withe Pre-Reading in preschool and moved our way quickly through Level 1 last year and even started Level 2 last year. We’re just picking up where we left off this year with Level 2. I cannot say enough good things about All About Reading. It has been a phenomenal fit for us, and the results for Sam have been amazing. I am blown away by his ability to read and comprehend. The lessons are easy to prepare and the teacher’s manual gives me plenty of information to feel completely equipped to teach my kiddos to read. Since we’ve loved the reading curriculum so much, it was no question for me that we would also use All About Spelling. They recommend having the Pre-Reading and Level 1 Reading programs complete before bringing in Level 1 Spelling so that’s what we’ve done. Once we started Level 2 reading, we also started incorporating spelling lessons to work in tandem. So far we are loving this curriculum as much as the reading one. I love how thorough the lessons are and there is a lot of review. We completed about ten lessons of First Language Lessons, Level 1 last year, and I’m happy with how it went. I decided to start over with the book this year as a way to review what he learned last year. The lessons are super short, and it works well with simply sitting on the couch and talking together about grammar topics. He hardly knows we’re doing grammar as a subject and that’s what I was hoping for at this stage. We incorporate this subject into Basket Time. 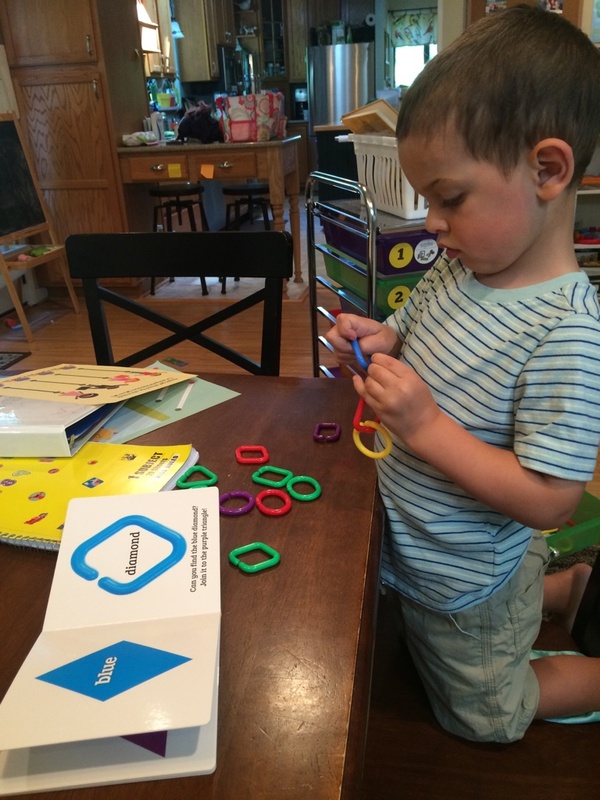 Write Shop Primary A came highly recommended, and we’ve completed one unit set so far. We really enjoyed it, and I can definitely see this fitting in with our overall flow for this new school year. The lessons are short and interactive which is where he thrives. Right now I’m doing the actual writing for him, but after this term, I hope to see him writing more of the sentences himself. There is copywork incorporated throughout our curriculum choices. Our science curriculum incorporates copywork into the lessons which is great because it’s usually a selected portion of scripture. I can also choose copywork selections for him during Grammar work. When we don’t have any cross over, I will let him practice tracing letters from our dollar store workbooks. Math is our least favorite subject. 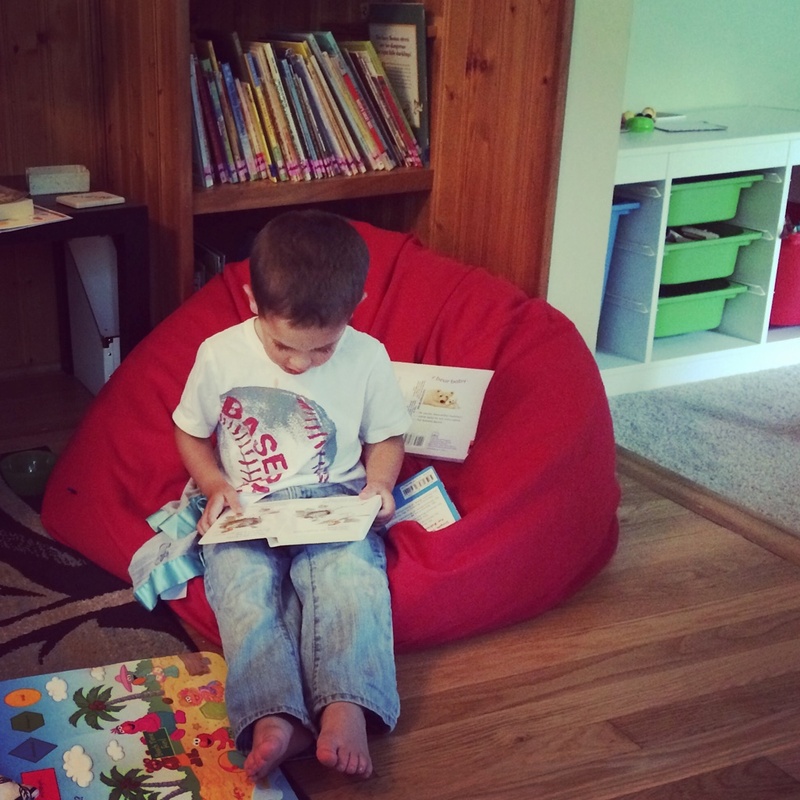 Give the kid a book and he will happily read with you. Tell him it’s time for science and he will shout with joy. Tell him it’s math time and the tears start immediately. My goal this year is to overcome his fear of math. I’m learning that he hates details. He’s a creative spirit so focusing in on one problem at a time is hard for him to do. He also doesn’t like anything he’s not good at, so math is a true challenge for him. We switched curriculum this year after a lot of research, prayer, and thought. I don’t even know how I discovered Math Mammoth Grade 1, but when I did I fell in love. I think it’s going to be a good fit in these early elementary years for Sam. We’ll see how it goes! I wasn’t going to get a formal curriculum yet for Science. That is until Sam started asking every other day to learn about the solar system. I did a short unit study on the topic last year, but it did not fill his tank. He wanted more details, more information, and just more than I could give him. I discovered Apologia Exploring Creation with Astronomy and decided to go for it. This boy could not be more excited! I desperately wanted to teach history in a way that’s exciting, enriching, and memorable, and I wanted to use living books. I just didn’t know where to start. As I researched, I discovered the term “spine” and it all clicked for me. I decided to get the The Story of the World, Vol. 1 as my “spine” for the next few years. Google the term if you’re not familiar. We’re in no hurry to “complete the curriculum.” We’re just going to work our way through it a little at a time and just enjoy learning as we go. If we start and he doesn’t seem interested, I plan to shelf it for a year, but I think we’re going to have a lot of fun with it. Much of Geography will be taught at random. We tend to use maps and globes often in our home. If a place is mentioned in conversation, we find it on the globe. If we read of a place in a book, we look at a map to see where it is in relation to where we live. We are also working on learning where all the states are in the U.S. However, The Story of the World incorporates map work into the lessons, so this will be a handy way of doing a little map work in a more formal way. I think he’s going to really enjoy it. One thing Sam tells me he wants to be when he grows up is an artist. I’m planning to do special art projects with the boys 2-3 times a month. Home Art Studio and Picture Studies will make up the bulk of our art study. Plus, we’ll read a lot of books about artists and visit art museums throughout the year. My husband plays the piano a little, so he’s going to be teaching Sam to play piano this year with Learn and Master the Keys. We’ll also do a composer study of Beethoven along with memorizing six hymns and learning about who wrote each one. I doubt we’ll go too much in depth on any of it, but we’ll at least get him introduced to the topic this year. I really want to write another curriculum study for my kids, but it’s just not in the cards right now. 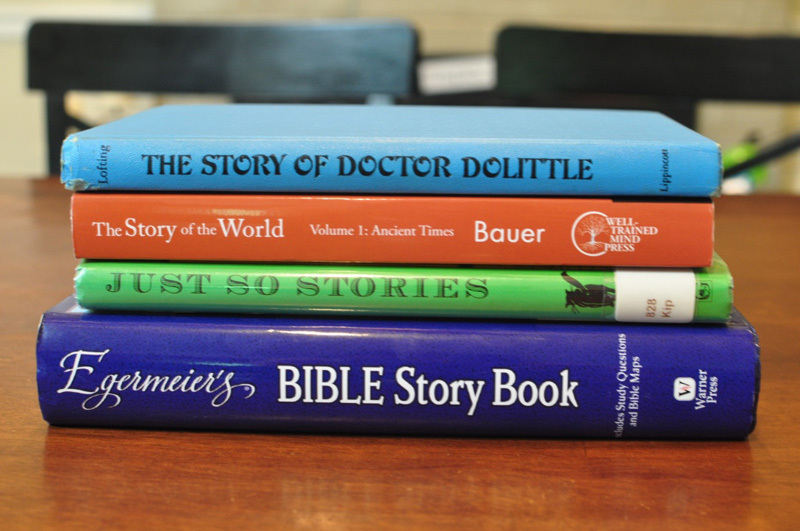 Therefore, I’ve decided to use Egermeier’s Bible Story Book for Bible reading time this year. The stories are short, but they pack a lot of details that other children’s story books don’t have. So far we are really enjoying it! We’ll also continue with our scripture memory work as well as memorizing the Westminster Shorter Catechism together. Curious to see what I did in the past with Timmy? 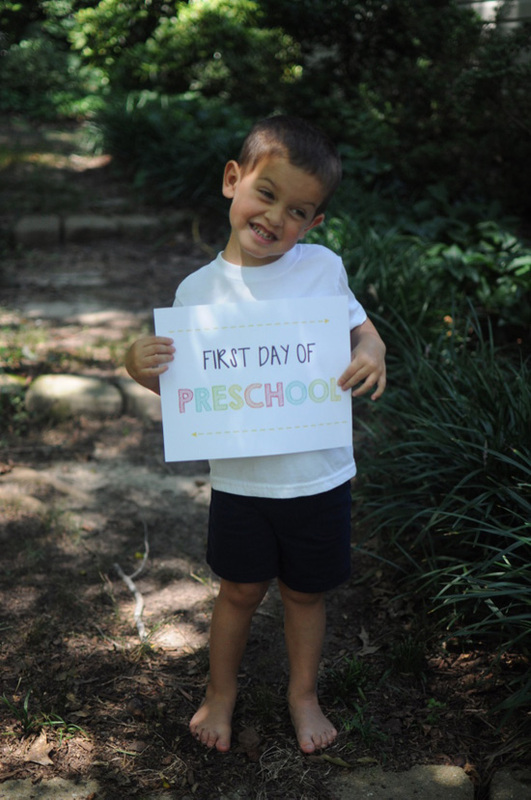 Timmy will be three years old this school year, so we’ll be doing preschool together. He’s very excited! You can see my general scope and sequence that I use here for this age range. He’ll be joining Sam wherever he wants, and he often does join us at the table. During Basket Time he has to stay in the room with us. He’s allowed to play with blocks and various other learning toys I have available, but he’s required to stay where I can see him and play quietly. He usually just sits in my lap or plays beside us as we read or work. He’s content just being with us and for that I’m thankful. However, I do have some intentional learning times planned for us this year. Lots and lots of books! He is so eager to do school with us. I look forward to seeing this year unfold with him because three year olds are my favorite. That’s what we have planned for our year. What about you? What curriculum will you be using? Love this Leigh Ann. Thank you so much for putting this together. We follow Charlotte Mason’s principles in our home as well, so it’s nice to see what you have selected that fits for your family. I used to be a teacher and I love to teach, but taking the time to plan has never been my strong suit. 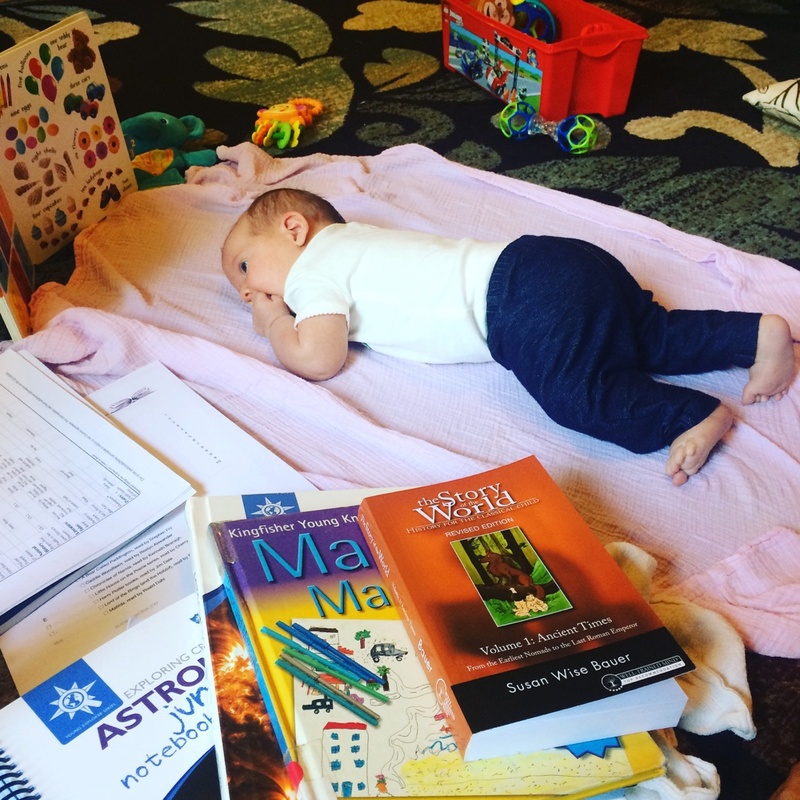 I also feel like last year, our first year trying to figure out a homeschool routine, was extra difficult due to multiple pregnancies, loss, and then a newborn. I am so inspired by all that you accomplish with your boys. It really pushes me to try more. I am learning a lot more about myself through this homeschool journey, and am trying to find the right balance between pushing myself to be more disciplined, but also enjoying the freedom and flexibility that homeschooling and childhood provide. Can I ask how many of these curriculums and resources you are using are new/used? Do you budget throughout the year to be able to purchase what you need? 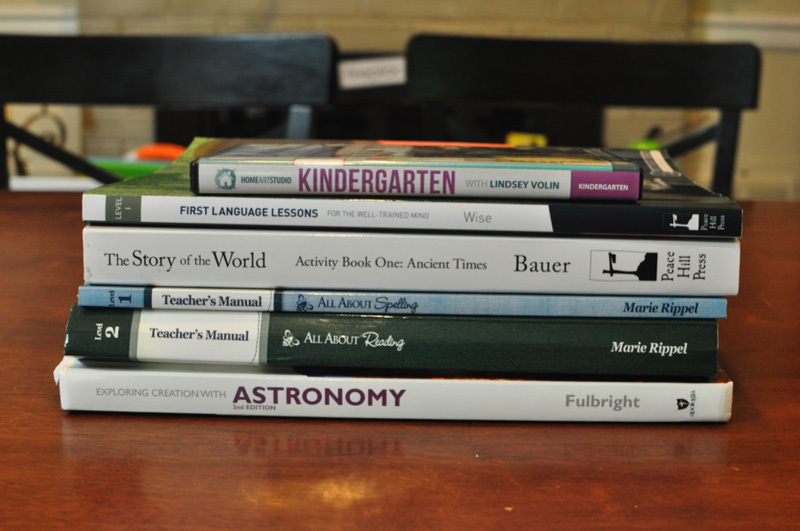 The upfront cost of a lot of curriculums can be a little overwhelming! We are going to use My Father’s World again. I used it for kindergarten and want to continue it for one more year to keep the continuity of the reading program, and also to give me the help I need since we are still just starting out. I am hoping that having the year planned for me will free me up to focus on other things I want to institute. And speaking of your basket time, do you listen to the podcast “Your Morning Basket”? 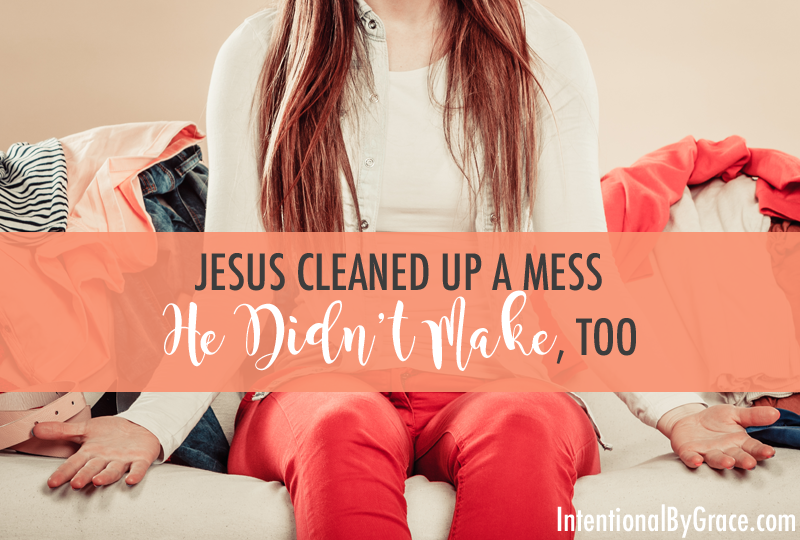 You probably do, but if not, it’s a great resource and one of my favorite CM podcasts! 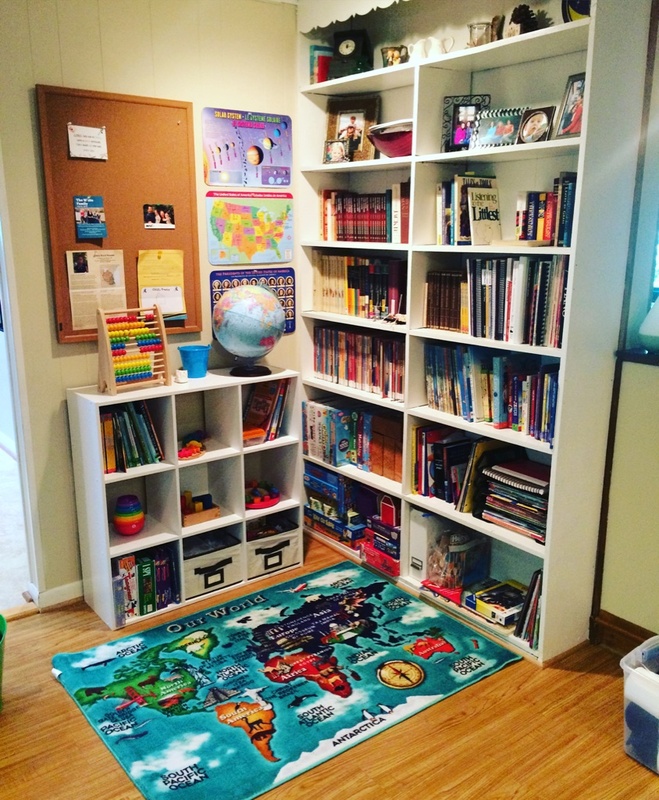 Just one more thing… where did you find that world map rug? I love it! Thanks for your encouragement. Like all moms, I can see all the areas I’m not up to speed. My house is a mess. I have a zillion unfinished projects floating around the house. My garden is over grown and we don’t have any clean underwear. I skip math lessons more than I should, and I spend an exorbitant amount of time looking up book lists and making book lists. Plus I’ll likely never read all the books on my list – for me or my kids. We didn’t have a single healthy vegetable on our plate at dinner tonight, and I don’t remember the last vegetable I put on my kids’ plates. And I could go on. You know? But right now in this season, I’m seeking to get one thing right – reading a lot of good books with my kids. I’ve spent years building lists of resources and even collecting the books we’ll be reading. And the truth is that I thrive in the organizing, planning, and even teaching. I’m not so great at making sure we get out in nature or bake together in the kitchen. I’m not very good at delegating chores and teaching practical life skills. Not really anyway. I do, but it’s more of a struggle for me. So, I say all of this to say that I think this is why I love community – I can see the areas you and others thrive and do well in and it pushes me to dig a little deeper, go another step forward. And I’m glad that my sharing does the same for you. That encourages my heart because sharing these sort of posts are hard for me. I always feel self conscious. This is such a good question, and a hard one for me to answer. I’m a collector of books and resources which means I’m always on the lookout for homeschool resources. I frequent thrift stores and used bookstores and have found many of the books on the reading lists this way, making the heavy reading curriculum much more affordable. We also use the library (I have cards at two libraries currently). Some of the teacher’s manuals I’ve been able to get used off Amazon for really nice discounts. But most of the main curriculum, I did buy at full price. We don’t necessarily have a homeschool budget. We aren’t great at budgeting in this house. We try, but we fail. However, we’re not big spenders either and it works for us. I usually know what I’m going to use the next year by February of the previous school year. I will pull together the figures and then space out the purchases throughout the next few months and as deals pop up so it’s not as big of a hit on our budget. This is also why I’ve steered away from boxed curriculum. I’ve found that a big hit all at once overwhelming, which is what sent me the other direction (various curriculum), and I’m glad it did because it turns out the pick and pull from various places fits my personality better. Also, this blog funds our homeschool so I know that if there’s a curriculum I really have my eye on, I can just do an extra sponsored post, etc. Hope that helps?! This wasn’t a question, but I wanted to respond. 🙂 I’m a little jealous of your use of MFW. It’s super attractive to me, but with Sam on so many different levels academically, a “boxed” curriculum just doesn’t work for us. Boo! I love seeing your homeschool posts on IG though. I will live vicariously through you! Yes I do. I haven’t been listening to a lot of podcasts lately though. Mama needs quiet. Not more stimulation. My house is so loud right now. haha! Maybe I’ll get back in the swing of listening soon. I love hearing adult conversations, but I hate having to start and stop so much. One day. One day. We used Apologia’s Astronomy last year. It was amazing. All of my children love, love, loved it. They learned so much that we kept with the series and started Flying Creatures of the Fifth Day this year. Worth every penny! I had to chuckle about your little girl not wanting to be put down! 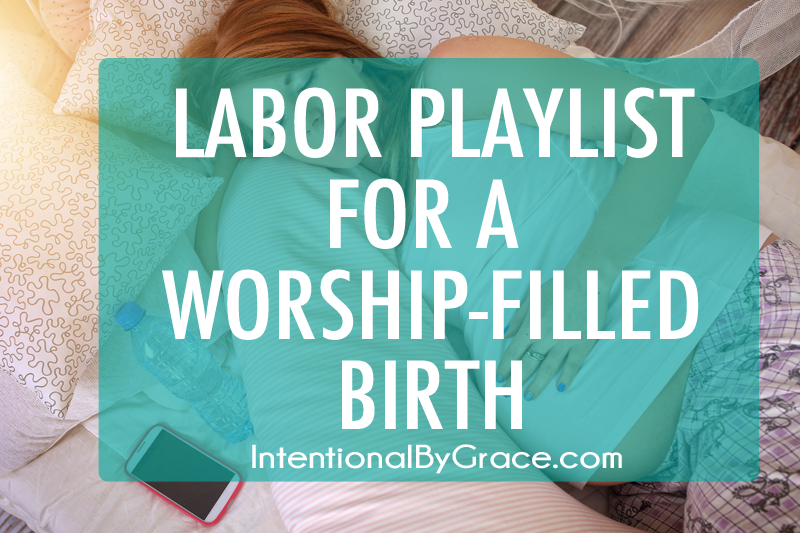 I was just where you are – homeschooling two – when my first daughter was born, and she was just like that. At six she is STILL like that (always nearby)! Lol. Love it! 🙂 Just want to be a part of the action!